Nursery storage worries can really get a mom-to-be in a tizz! Baby nursery storage is not a matter to be taken lightly! If you are not well organized, you can quickly feel like a tired salmon swimming upstream! Under the changing table, in the closets. Storage baskets will be your number one nursery storage sanity saver! And speaking of closets, take a look at these great closet organizers. See all those spaces just waiting for baskets? Ok - so where do we start? Your nursery storage requirements are best determined by allocating a space to every item on your Baby Layette List. To make your life easier, I have created a detailed Nursery Storage List for you to follow. The outline is based on the Creative Baby Nursery Rooms Baby Layette List. Change the baby layette list by adding extra items, or taking off items that you feel you won't need. Then adapt the nursery storage list accordingly. After this you will be ready to make some decisions regarding your baby nursery furniture. Where To Store Each Item. In order to fulfill your nursery storage requirements, determined above, you will have to make a choice among the many available items of baby nursery furniture available. Storage available in the rest of the house. The size of your baby nursery. Whether or not your baby nursery has a closet. If you have plenty of space and a generous budget, go to town. Your primary concern will be to buy baby nursery furniture that is safe, user-friendly and attractive. Don't worry about buying too much - when it comes to little people you can never have too much storage space! Just make sure that it will all fit nicely in your baby nursery by drawing a baby nursery floor plan before you buy everything. Find out how to draw floor plans for your baby nursery here. Click here to see a complete list of your baby nursery furniture options, and browse our baby nursery furniture pages to find out what's available and what works. After all the ups and downs of birthing, feeding, changing, dressing and generally pampering four precious babies, I think I can safely say that I know what works, and what doesn't, in terms of organizing yourself for baby on a budget. There are many baby nursery furniture options available on the market today. Most are not necessary, however. In my opinion, you only really need five items of furniture for your baby nursery. Somewhere to sleep - A baby crib. Somewhere to change, dress and mess with baby - A baby changing table. Somewhere for all the used baby outfits - A nursery hamper. Somewhere to keep feeding supplies and lamp - A nightstand or table. Somewhere to sit and feed baby - A rocker or glider chair. So, how are you going to fit all that stuff into so little space? - Ah - I have a plan! And the plan is simple. *Items marked with an asterisk are nice-to-haves, but not essential. - and you'll realize it's really not that much - that's why the plan is so simple! Store 3 blanket baskets under here. If the crib you have chosen has storage drawers, use these instead of baskets. Your baby lamp, nursery night light and tissues go on top. Store your feeding items in a drawer here. If you have a table with no drawers, put your feeding basket underneath. 3. The changing table / dresser. Put the changing pad with its cover on top with the waste basket and *wipes warmer. Put your after-bath basket and your changing basket next to each other in the top drawer. Hang your diaper stacker against the wall above the changing table. Put baby's clothes in the other three dresser drawers. Put the diaper pail/ *disposal system on the floor next to the changing table. Keep your nursing pillow here. Put up 2 medium length shelves somewhere in the nursery. (Not above the crib - this is a safety hazard. Alternatively you can buy baby changing tables with hutch attachments that provide storage just where you need it most. Or consider this diaper shack. The *humidifier and *air purifier can be set up on a third shelf. The *portable crib and stroller will fit under a bed, in the garage or in the back of a car. Your diaper bag can be left fully packed in the back of your car. When you take baby out, just add bottles if required. The *bouncy chair and baby gym will be around the house in constant use anyway, so they really do not require storage most of the time. That leaves the front/back carrier / sling. 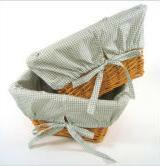 Tuck it into one of the blanket baskets. If you do intend to store things in your baby room closet, a closet organizer is a great way to make the most use of the space. If cost is a concern, go for a canvas option. Or you could always try installing a few shelves of your own. 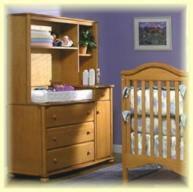 Now you have customized your layette and nursery storage list, and you know what your must-have furniture needs are. It's time to start furniture-hunting for those few necessities. Start by finding a baby crib that you like (if you haven't already), as well as, a baby changing table, nightstand, and rocker or glider chair. If your nursery is very small, click here for unique nursery furniture space-saving ideas before you start furniture-hunting. If your budget is limited visit our discount baby cribs page, and discount baby furniture page, for ideas to stretch your cash further. And voila - you're done. 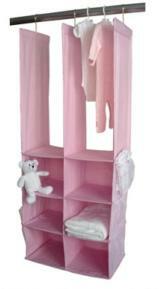 Everything you need for baby, tucked away in its own little nursery storage space ready for the big day!